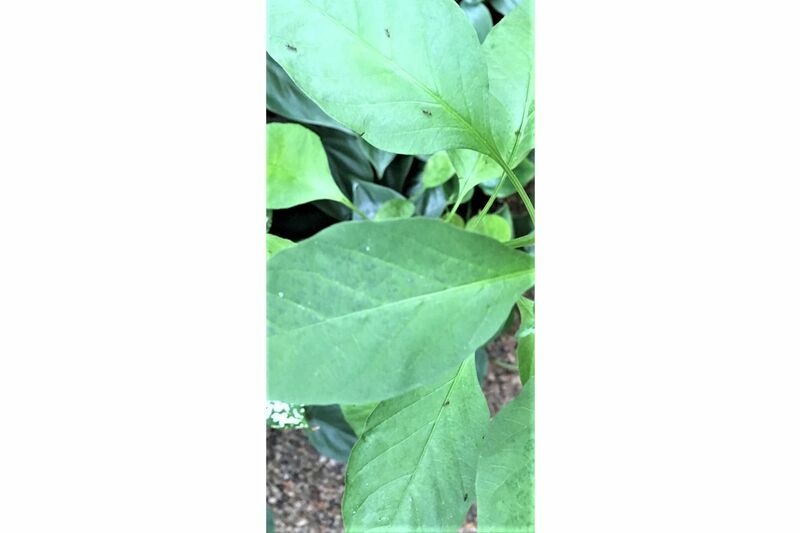 There are white patches (above) on the leaves of my bean sprout and they turn transparent. What happened to my plant and how can I save it? I grow it indoors with LED lighting. Your pea seedling (its botanical name is Pisum sativum) appears to be suffering from a fungal disease, most likely powdery mildew. Ensure that you are using fresh, sterilised soil to start your seeds and that the seed tray is situated in a bright and airy location. Spores of the fungus, for example, can infect seedlings if the soil is contaminated, kept moist for prolonged periods and there is a general lack of sunlight and sufficient air circulation. Infected plants are difficult to treat and preventive measures should be taken to reduce the likelihood of infection. My chilli plant grown from home chilli seeds is now about 50cm tall. But in the last few days, ants have appeared on the leaves (above). Why do they infest the plant only now and how do I get rid of them before the whole plant gets destroyed? The appearance of ants may indicate the presence of sucking pests such as aphids, mealy bugs and whiteflies, which are common pests found on chilli plants. These pests are capable of excreting honeydew, which is a sugary liquid that attracts the ants. Check for these pests and use the appropriate control, such as by spraying the plant regularly with summer oil, soap solution or neem oil. This is a beautiful creeper (above) planted by the National Parks Board along roads. It grows fast and I see it being trimmed monthly. What is its name? This creeper is a species that has long been used as groundcover in local landscapes. 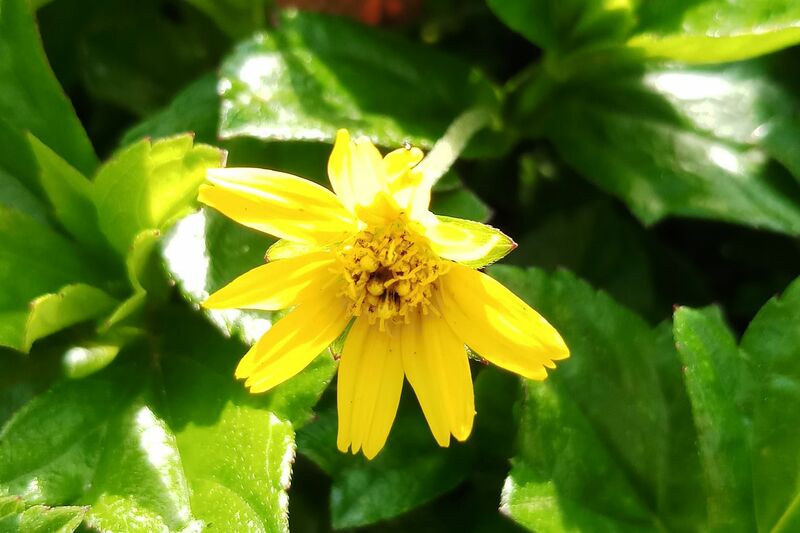 Its botanical name is Sphagneticola trilobata and is commonly known as Yellow Creeping Daisy or Singapore Daisy. It is actually native to tropical America. It propagates easily from stem-cuttings and grows best under direct sunlight to promote flowering. It also thrives in moist soil. Note that it can get rather weedy and, if regular maintenance is not performed, it grows into areas where it is not wanted. I water my plant only once a week, but the leaves are curling up (above). Is this due to a lack of water? 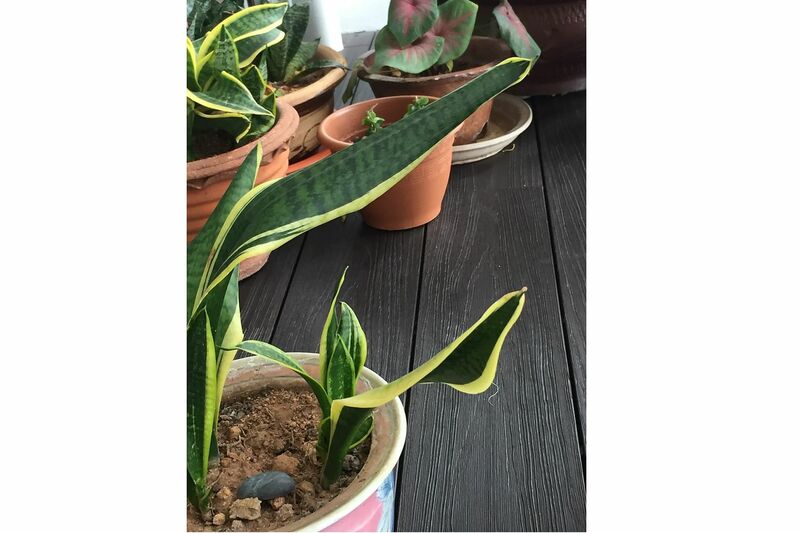 The plant is botanically known as Sansevieria trifasciata - with this being the Laurentii variety - and commonly called Mother-In-Law's Tongue or variegated snake plant. It is often sold as a houseplant and used in local landscapes. Although it is often regarded as a drought-tolerant plant, it must not dry out totally. A severe lack of water for the plant manifests as slight folding of leaves, soft and floppy leaves, and the appearance of wrinkles on the leaves. It appears that your plant is grown in a clayey and compacted soil mix and this can be difficult to dry out under indoor conditions. Plants growing in wet soil can suffer from root and crown rot. When dry, the soil becomes a dense, caked-up mass where water will not percolate to the roots easily. It is advisable to grow the plant in a more porous mix, where coarse, gritty material such as coarse sand, pumice or fine expanded clay pellets (Leca) is incorporated into the mix. When you water the plant, ensure that water drains from the drainage holes at the base of the pot. Allow the soil to dry out slightly before watering again. Also, make sure the plant is grown under optimal light conditions - that is, at least four hours of filtered sunlight - so that it is healthy and the root zone does not stay wet for prolonged periods. I planted an avocado from a seed. The seed was half-submerged in water until the roots and a stem with leaves appeared. Then I transferred it into soil. It took almost two to three months. The plant was doing fine at first, but the leaves started to turn brown. Part of the stem at the top is turning black. I have tried to move the plant away from the sun and put it under shade. What happened to it? Is the strong sun the reason the leaves turned brown? What should I do? The browning of leaves is probably caused by the inability of the plant to adapt to a hot and sunny environment. The heat from the sun dries out the leaves and roots. Note that the avocado seed, when raised in water, produces roots that are more accustomed to an aquatic environment. Whenever such propagation material is first moved to soil, the plant should be situated in a cool but bright place to allow it to produce more roots and adapt to the new growing environment. You need to gradually move the plant to its final growing location over a period of two to three weeks during this "hardening" process. For now, you will need to monitor the condition of your plant. New growth will normally be produced if its existing roots and shoots are not severely compromised. If the shoot or roots have died, you may have to start afresh with a new seed, taking into account the advice given above.